When Must a Couple Get Court Approval For an Agreement? When a divorce is looming, but not yet filed, at what point must the husband and wife get court approval for family law agreements? 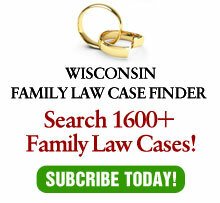 The answer is not clear, as the result of two recent published Wisconsin court of appeals cases. Now, the Wisconsin Supreme Court has granted review of an unpublished court of appeals decision that may shed light on the topic. In Evenson v. Evenson, 228 Wis. 2d 676, 598 N.W.2d 232 (Ct. App. 1999), the court of appeals reversed a trial court for holding the husband to an agreement signed during the pendency of the divorce relating to husband’s purchase of a parcel of real estate. The agreement used the caption and case number of the divorce case, but was not given signed approval by the court. Before the granting of the divorce, the husband changed his mind and wanted to vitiate the agreement. The wife sought its enforcement. The appellate court distinguished between agreements that contemplate a continuation of the marital relationship, which are reviewed only for fraud, and those agreements that are made in contemplation of divorce, which require court approval. The appeals court held that the husband was free to vitiate the agreement, since it was a divorce stipulation and the court had not approved it. In Ayres v. Ayres, 230 Wis. 2d 431, 602 N.W.2d 132 (Ct. App. 1999), the parties executed an agreement prior to the commencement of a divorce action, stating in the agreement that it was intended to be applicable for their divorce. Consistent with their intent, the wife filed for a divorce five days after the agreement was signed. The husband sought to vitiate the agreement. The wife claimed that the agreement was enforceable pursuant to Wis. Stat. §767.255(3). Therefore, the agreement fell under Wis. Stat. §767.10 and was not enforceable unless the court approved it. As stated in a previous article (“Court’s Approval Key For Predivorce Agreements”, Wisconsin Opinions, October 13, 1999), these holdings are problematic. While there would be a clear rule if an agreement signed during the pendency of a divorce proceeding were subject to approval by the court, the holding in Ayres extends this rule to where divorce is only contemplated. Since many marital agreements contemplate a divorce (and if they don’t, they may not be enforceable at the time of divorce), the line is no longer clear as to when these agreements require court approval. Is it required when it is too close to the eventual divorce? And, if so, how close is too close? Now, the Supreme Court has granted review in Von Boxtel v. Von Boxtel, Case No. 99-0341, (Ct. App. April 11, 2000. In that case, during the pendency of a divorce action, the wife asked her husband to sign an agreement giving up any marital property interest in a parcel of real estate she wished to purchase. The court did not approve the agreement, finding it to be inequitable and signed under duress. Citing Ayers, the court of appeals affirmed. By accepting review, the high court has an opportunity to clean up this confusion- although it is questionable whether this is the proper fact situation for it to do so. Certainly, under Button v. Button, 131 Wis. 2d 84, 388 N.W.2d 546 (1986), the trial court has the power to vitiate any agreement if it is inequitable or signed under duress, whether it was signed during or before the pendency of a divorce action. The real issue that needs to be addressed is: Assuming the agreement meets all other requirements for enforcability, such as voluntariness and fairness, when does a court need to approve an agreement for it to be enforceable? If the rule is that such a requirement is triggered by the filing of a marital action, there would be clear rule for parties to follow. The problem arises in cases with circumstances similar to those in Ayres, where no divorce is pending, but one is shortly forthcoming. That fact situation, which contains pitfalls for both the parties and their attorneys, would not be addressed under the holding of Von Boxtel, except possibly in dicta. Perhaps the supreme court should wait, therefore, for a more appropriate fact situation before jumping into this issue.